Local Malagueñas enjoying their home town feria. The annual Malaga city fair in August is an exuberant week-long street party with plenty of flamenco and 'fino' (sherry). The fair commemorates the re-conquest of the city by Isabella and Ferdinand in 1487 and traditionally runs for a week from Saturday to Sunday (inclusive) over the third week in August. This castanet-clicking fiesta starts off with a bang, literally, with an impressive firework display in the Paseo del Parque which can be seen for miles around. The best view is from the Port area or Muelle Uno or from the rooftop terrace bars of city centre hotels. The fireword display is at midnight on the Friday night before the opening Saturday. This is usually followed by a free concert by a top Spanish artist or band on the beach at La Malagueta. Dancing 'sevillanas' at the Malaga Feria. The following day the people take to the streets, the women in flouncy flamenco dresses, to dance, drink and, generally, make merry. The traditional dance of Andalucia is called 'Sevillanas' comprising four distinct dances with plenty of finger-clicking, foot-stomping and, above all, feeling. This is where 'dancing in the street' can be appreciated spontaneously 'en vida' which is really the only way Spanish dancing should be performed. This city fair is concentrated around Malaga's main shopping street - Calle Marques de Larios (Calle Larios for short) which is decorated with paper lanterns and flags. Millions of people visit the fair, although very few tourists seem to even know about this intrinsically Andalusian traditional fiesta which, in Malaga, is two distinct events, in the centre during the day (Feria de Dia - Day fair) up to 18.00 hrs and at the fairground (Feria de Noche - Night fair) from around 21.00 hrs until dawn. The Feria de Noche latter is an immense precinct to the west of the A-7 near the Palacio de Congresos building where various associations install their 'casetas' - large huts or booths for entertainment and refreshment, where old and young alike meet up in laughing gossiping circles, surrounded by swirling dancers and waiters rushing around tripping over babies and young children and making sure that everyone is continually topped up with fino and 'tapas'. The casetas are much more open to the public those in Seville. As long as you are dressed (anthing from smart casuall upwards), as the dorman politely and you can enter. The 'Caseta municipal' is always free and has a wide range of acts and live music. The casetas are also where many business deals are struck between local Malagueños who have closed their conventional office for the week. Outside, the fair is a gaudy, raucous fairyland of dazzling lights, deafening music, soaring ferris wheels and careering dodgem cars, an assault on all the senses and incomparable to any 'conventional' fair elsewhere. 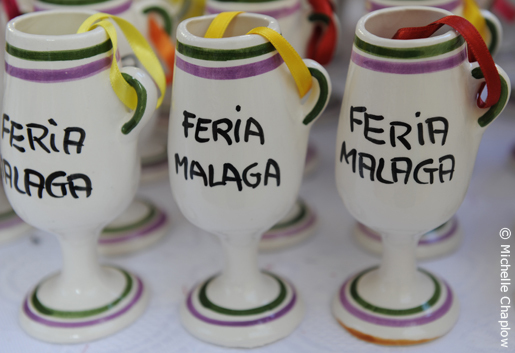 The typical feria drinks are Malaga Dulce (Malaga sweet) wine and Rebujito ( fino or manzanilla mixed with lemonade or sprite). Typical feria food is Pescaito which is a selection of fried fish from Malaga. Your very own drinking cup for the Malaga Fair and a lovely souvenir. The Andalusian feria is celebrated in the majority of towns and even villages at some time between Spring and Autumn and for the locals means far more than a holiday from work. They are the very reason and justification for the year, occasions to be immersed in with passion and commitment. Some, like Malaga, Cordoba and, particularly Seville are rich and glittering affairs attracting millions of visitors while others, such as the feria of the village of Casares is a far smaller version; an exuberant street party where everyone knows everyone and relatives who have moved away return to join their families in the all familiar annual celebration. 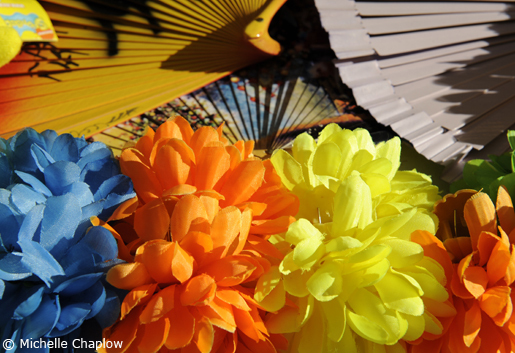 Flowers and fans are a must at Malaga Feria. There is patent rivalry between the two main Andalusian cities, Seville and Malaga – especially when it comes to festivities. In April, Seville boasts the illumination of something like 500,000 lights for the inauguration of the town’s massive annual fair. In true competitive spirit, Malaga strives to go one better and in 2004 it was reported that they nearly hit the half million mark – and so the one-upmanship went on. It slowed down in the aftermath of the 2008 financial crisis and the introduction of diode lights have made the light bulb count a little irrelevant. Malaga is the largest Summer fair in Spain which excludes Seville's Spring Fair. This Festival of light by night is just one aspect of the ‘Feria de Málaga’. The inaugural (Friday) night of the Fair is launched with the traditional ‘Pregón de la Feria’ (opening address) read out from the Town Hall balcony, followed, on the strike of midnight, by an awe-inspiring fireworks display. This ‘Big Bang’ is a magnificent show of Malaga’s muscle in the party prowess department and is best appreciated from Malaga Port and Muelle Uno, where thousands gather vying for a privileged view of this magical scene. This is usually followed by a free concert by a top Spanish artist or band on the beach at La Malagueta. 'Faralae' dresses are typical of Malaga Feria. The Feria celebrations date back to 1487, when Los Reyes Católicos, Isabella and Ferdinand re-conquered the city. 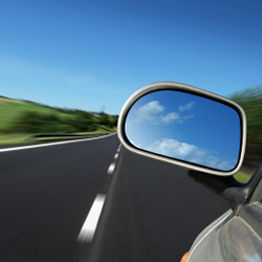 Over time, it has evolved into a huge event and it has two distinct facets – day and night. ‘La Feria de día’ warms up around midday. Restaurant and bars are full and spill over intot he street. Bands play free concerts in the little squares of the city centre. Head for Calle Llarios and follow the crounds. This Feria de dia oficially finishes at 18.00 hrs This finishing time is earlier than some years ago and is now strictly observed by bars who turn off the music. The feria goewers and in particular the younger prefer to hang around and finish their drinks. The street cleaners and their hose pipes arrive in force and mark the real end to the Feria de dia. Hundreds of people take to the streets of the city’s historic centre, which are beautifully decorated and food, drink and trinket stalls are set up. Shops and businesses close and the classy pedestrian shopping street, Calle Marques de Larios, and surrounding area are transformed for the duration of the celebrations. Soak in the wall-to-wall swishing flamenco dresses, gleaming Andalusian horses, music and spontaneous dancing and you understand something of the Andalusian love of life and ability to party. By night the place to be is the Feria de Noche at the big purpose built Fair Ground called 'El Real' , set just on the edge of the city, west of the A-7 near the Palacio de Congresos. There are shuttle buses laid on from the Alhameda in centre of the city. The Cercanias train station 'Victoria Kent' is the nearest. From around 21.00 hrs till dawn this massive purpose built fiesta area vibrates with life. Here, 21 st century technology mingles with old Andalusian traditions. From fairground rides, to live music and dancing and endless food, drink and entertainment, the choice is vast. If you do nothing other than people-watch. 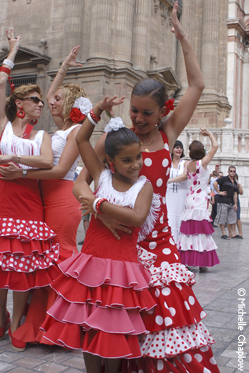 You will enjoy a sense of theatre when you see the stunning elegance and beauty of some of the women and men milling around or dancing traditional Sevillanas, till dawn. However the number of people wearing traditional dress is slowly diminishing over the years, cost and heat are cited as the reasons. A third choice is the selection of bullfights in the city’s bullring at La Malagueta.